Of course, when purchasing a new ERP system, one of the first questions everyone asks is: How much will it cost? Many factors are involved, from purchasing and installing equipment to configuring the software to ongoing maintenance. Most pricing models just calculate the initial hardware infrastructure, software licensing expenses, and implementation costs, but do not consider the impact of ongoing operating expenses. Your ERP price may vary depending on your scope of implementation, number of employees, customizations, and deployment method (on-premise or in the cloud). Let’s take a closer look at the factors that can affect ERP pricing—and the unique pricing model that can dramatically reduce your costs. ERP price structures explained. ERP pricing has changed forever, thanks to the cloud. Cloud ERP can certainly save you money, but read your vendor’s pricing policies carefully. For maximum savings, choose a vendor that charges by resource consumption, not per user. Can the Cloud Improve Your ERP Pricing? In our pricing model, we first look at the potential cost savings or Return on investment (ROI) the system will offer you. Some results can be hard to measure, such as improvements in employee satisfaction and teamwork. As part of our due diligence our local partners can help you determine your possible ROI. The software license fee is not the cost of the software. The total cost of owning and maintaining the system over the 7 to 10 years expected life includes a great deal of "hidden" on-going people costs, plus your annual maintenance fee. That fee is typically about 18% of the current list price of the software every year. This means you are repurchasing your system every 5.5 years. Maintain your current legacy ERP system and receive no additional business benefits. We call this “The Cost of Doing Nothing”. 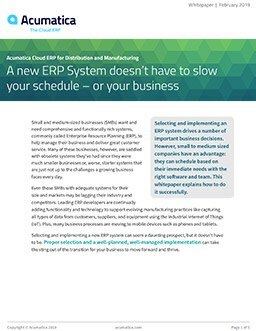 Replace your current system with a modern ERP system and start realizing the additional benefits of increased ROI. Acumatica has developed a simple tool to help in developing the cost of both decisions. We start by asking you 5 simple questions. Complexity of the implementation project will determine the amount of effort. What is the probable complexity of this project? Training staff on the new system. Your implementation partner can give you an estimate of the project complexity, but understand it is only an estimate.